Even though the weather is warmer, my family still enjoys soup for dinner. Especially vegetable soups. This is a classic recipe from my mother-in-law that is my husband’s favorite. My little girl is also a huge fan. This soup is so quick and simple. I usually try to have all the ingredients on hand as a back-up meal or quick lunch when we need it. It’s a filling meal, but also doesn’t feel too heavy or rich, which lots of chowders do. Even though this meal has few “fresh” ingredients, it still tastes fresh, and it fits for spring or summer. I also tried making bread bowls this time. They turned out really tasty and were pretty easy, too. I’ll post the recipe for that soon. 1. Melt butter in large saucepan over medium to medium-high heat. Add onion and saute until softened, about 3-5 minutes. Add flour, garlic, and pepper. Stir constantly until mixture starts to lightly brown, only 1-2 minutes. 2. Stir in chicken broth and water. Make sure to stir well so there are no lumps of flour. 3. Stir in corn and hashbrowns. Bring mixture to a boil, then reduce heat to medium-low and simmer for 5-10 minutes stirring occasionally. You want to simmer this just until everything is warmed through and soup has thickened. 4. Add in milk and grated cheese. Stir and continue to cook until cheese is melted. Serve immediately. Recipe Notes: I cut the butter in half from a standard roux for this recipe. It works well, but it is a bit thicker than a normal roux. This just means you have to stir a little more to prevent lumps when adding the liquid. I usually eyeball the corn and potatoes, but I did my best to measure the amount I put in. If it looks a little skimpy on the corn or potatoes, feel free to add a little bit more. I prefer the cubed potatoes (“southern” style), but shredded also work. You can also cut up a fresh potato and add that, but you will need to cook it for a bit longer. This soup also tastes great with some chopped up broccoli florets thrown in. 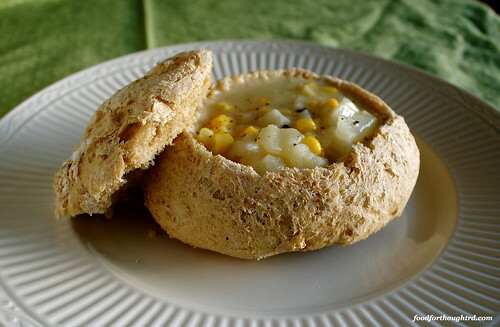 The nutrition information does not include serving it in a bread bowl.